Every Friday authors from around the world gather at the virtual fireside of fellow blogger Rochelle Wisoff to share fiction stories of 100 words – prompted by a photograph – and exchange constructive criticism. Readers’ comments are also welcome. This week’s photo prompt (I love the composition and colours in this photo) has been provided by Jennifer Pendergast, whose blog is Elmo Writes, where she describes herself thus: … an English lawyer, moved to Canada and gone straight – I worked part-time as a waitress until October 2012 and now I’m a full-time Mum while devoting my “spare time” to writing, editing and writing about, my other favourite creation, fiction. 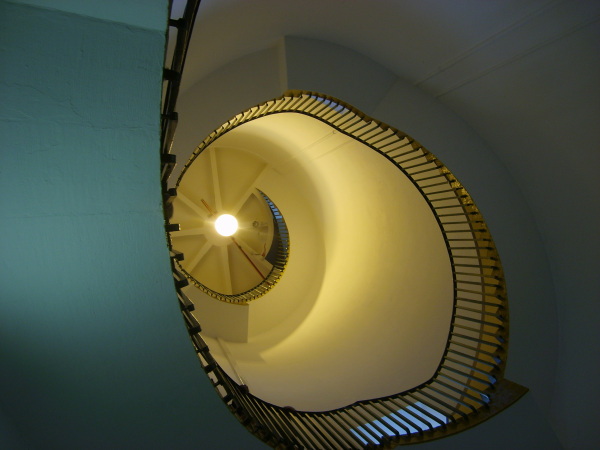 Jennifer’s own story about her photo is Fibonacci’s Tower. Jennifer, I almost wrote a story incorporating The Fibonacci Sequence myself! I look forward to discovering how many other Friday Fictioneers went in this direction, prompted by your photo. Jeff shot ‘Professor’ another look. Annelise led me through a door leading from the landing of the spiral staircase. There were others: Russian…. “Tea?” She asked, whiskers twitching. This entry was posted in Dialogue, Short Story Writing, Writing and tagged Comedy Writing, Cooper's Pairs, Dialogue, Fibonacci number, Fiction, Flash Fiction, flash fiction, Friday Fictioneers, Josephson's Junctions, Online Writing, Quantum Tunnelling, sci-fi, Sci-fi Writing, Shapiro Steps, Short Story Writing, time-space, Writing. Bookmark the permalink. I really enjoyed reading this and, like Sandra, would love to read the longer version. I’m usually a bit dense with sci-fi pieces, but I’m pleased to say I got your story straight away. Sorry to hear about your fall, do take care. Thanks. I’m okay now. I wasn’t badly hurt, physically but rocked my very tight ship! Loved the way you put so much into just 100 words. Talent! I respect. Really enjoyed reading this – am intrigued and looking forward to reading the longer version. Great story – loved this and would like to read the longer version. Well done. Annelise in Wonderland? 🙂 Although it sounds more like she ended up a bit like the Cheshire Cat. I got the mouse part (that’s why I said “a bit like…the cat”) but was merely remarking on the similarity. If I’d had my wits about me, I would have said she seemed to be a Cheshire Mouse. Ahhh, well..
Hi Ann… you better change your link on the FriFic page… you put in the wrong add and it is going to your edit page and it is blank. I am pretty sure your post went into a wormhole because your link isn’t working and I had to get here by some scientific work of my own…I didn’t notice any Russians or mice here Just Ted, yourself and some weird self professed poet. I have to say at first I thought you were talking about that lady who captured a giant squid on camera but of course I was wrong. I learned a few things here and enjoyed this post. Well back to the rabbit hole..I mean wormhole…time space tunnel….whatever it’s called. Clicking my heels… nothing seems to be working…I am still here. Oh post comment got it! Bye. I like this story all the way through, but not sure I get the ending. Why “Russian” and why “Whiskers?” Is her time jump for good or for ill? Lots of intrigue here, Ann, I feel you have a lot more of this story in your head! Thanks for the link and your kind words on mine, and on the photo. I’m so glad someone else saw the Fibonacci-ness of these photo. An astute observation – yes there is a lot more story in my head. I had to cut it down from over 250 words and probably shouldn’t have. There was another character – a psychic – who got the chop! I learned that with a form as heavy with meaning, in science and in myth etc, as a spiral, there are too many choices and junctions (Josephson’s and otherwise)! I’ll take that as a positive response!